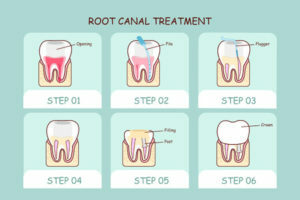 A Root Canal Therapy is the restorative procedure indicated when an infection surpasses the enamel and dentin layers, entering and affecting the pulp. The pulp, which is the third and deepest layer of a tooth, houses blood vessels and nerves supplying nourishment and sensation to the tooth. Infection of the layer is also referred to as irreversible pulpitis and can only be treated by the removal of the pulp, followed by the filling of the root canals. A root canal treated tooth, fitted with a crown is completely devoid of all sensation. If a pulp infection is left untreated however, it has result in early loss of a tooth. Book an appointment with the team at Baucum Family Dentistry today to learn more about how you can keep dental infections at bay.